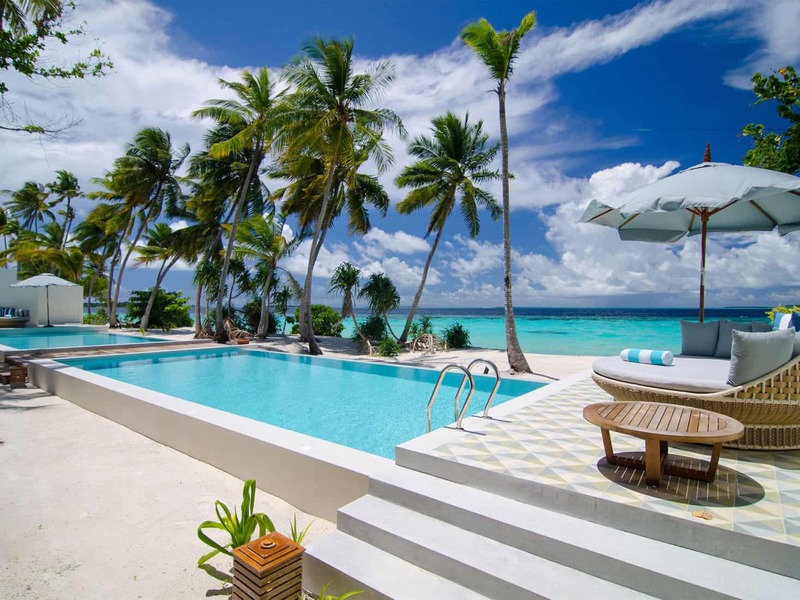 If you are looking to spend your vacation at an absolute-beachfront property on a spectacular tropical island pristine white-sand beaches, coral reefs and azure waters rich with marine life, the Amilla Great Beach Villa Residence is the place you want to be. If you are planning your friend’s reunion or large family celebration, this is the best property you want to choose. 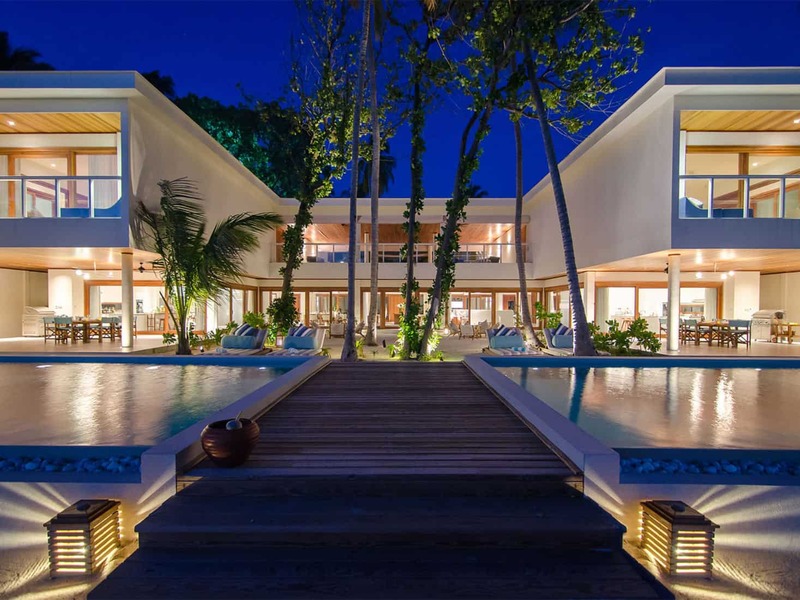 The villa features ultra-luxury living with a breezy laid-back. 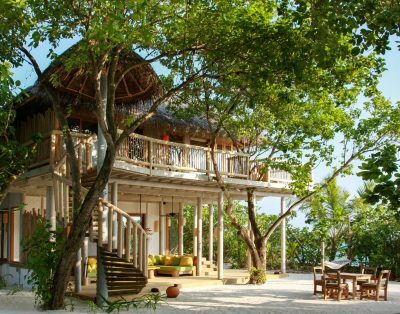 Staying at this Amilla luxury property you will have access to the top-notch restaurants, diving, water and land sports, spa therapies. 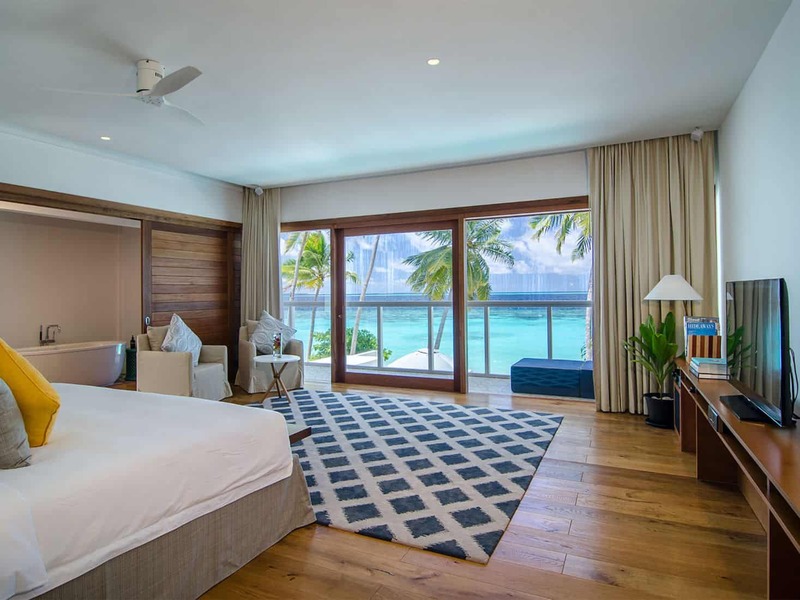 On Amilla Fushi, this is the largest of eight luxury residences, on the idyllic coral-rimmed spec of an island sitting within a UNESCO World Heritage Biosphere Reserve on the eastern edge of the Maldives’ Baa Atoll in the middle of the Indian Ocean. 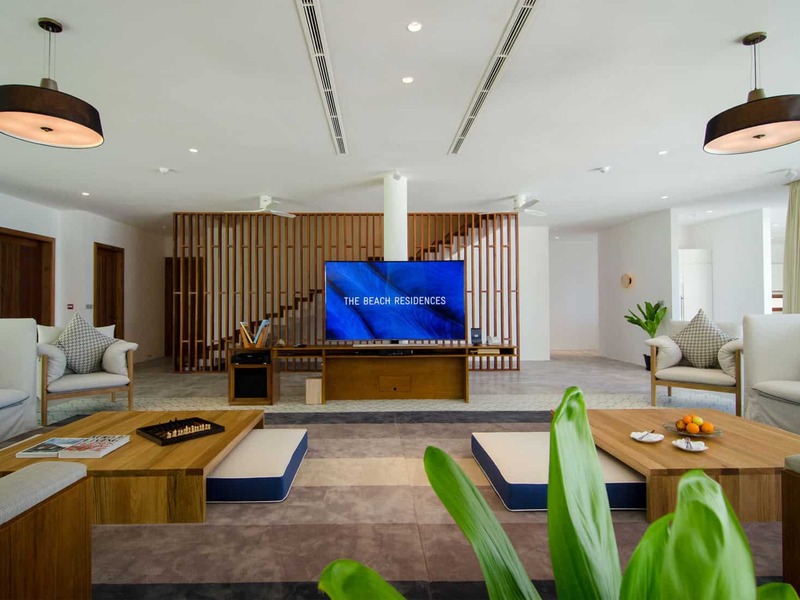 Amilla Fushi Great Beach Villa Residence features a contemporary design with carefully curated interiors, offering two palatial master suites, six further guest suites, and abundant living space for both entertainment and relaxation. 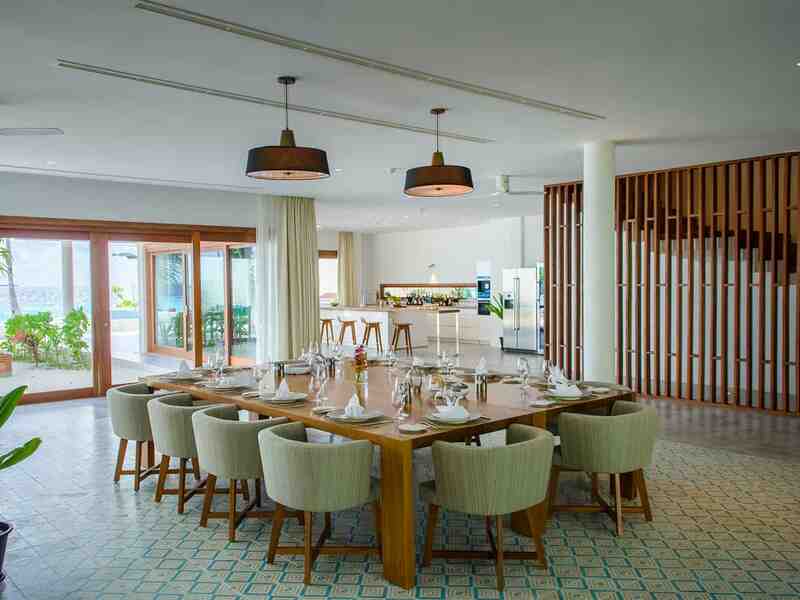 You’ll love to enjoy your time at the two alfresco dining decks and two private beach-edge swimming pools. 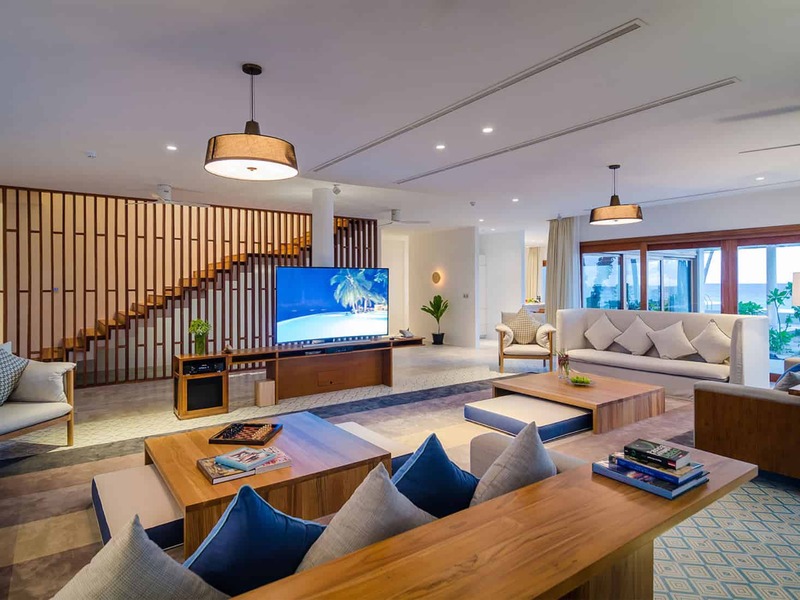 The estate includes luxury facilities like a gym equipment, table tennis, pool table, a PlayStation 4, myriad board games, and more TVs and DVD players than one can count. 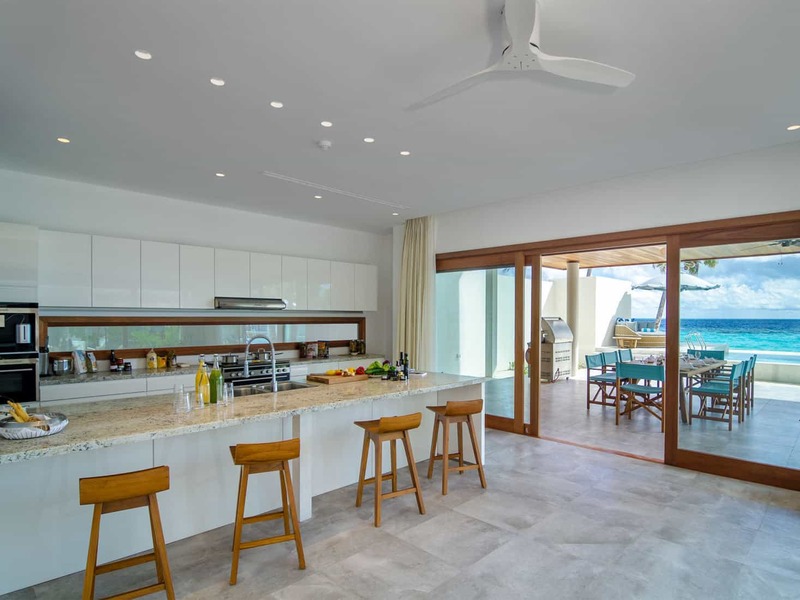 The kitchen and bar are both exceptionally well equipped – think range cooker, barbecue, coffee machine and wine fridges, and iPads and Marantz sound systems are among the high-tech gizmos. 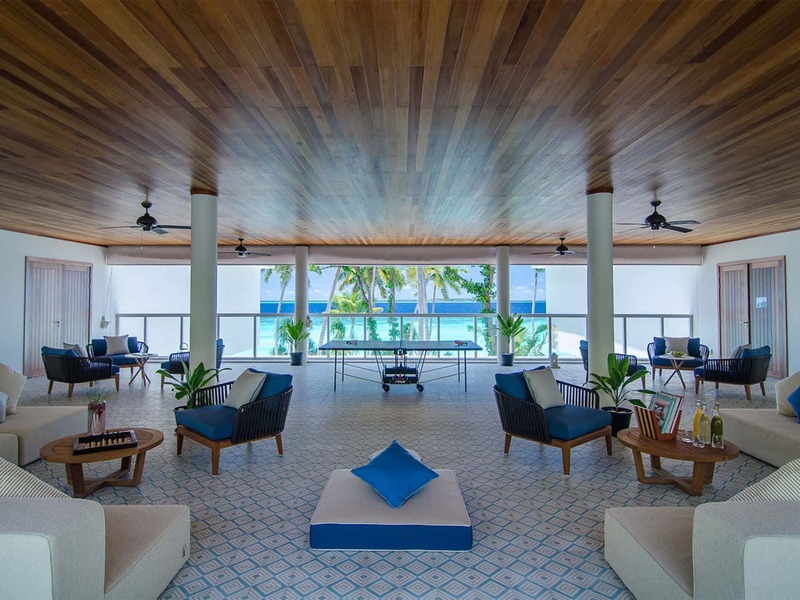 Helping residents feel at home – Amilla Fushi translates as ‘my island home’ – is a friendly katheeb (house master) who takes care of each guest’s every need with grace and from-the-heart generosity in true island spirit. 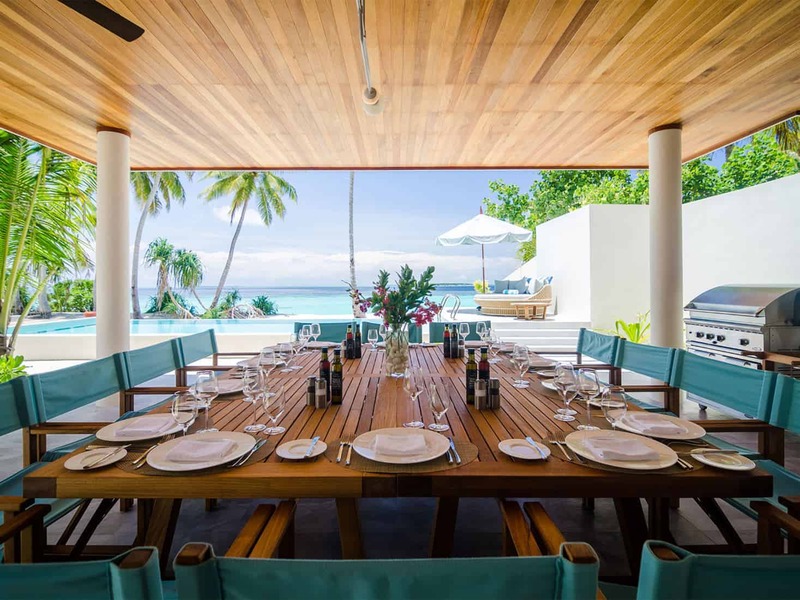 A Rolls beach buggy and bicycles, pillow menu, and two extensive Providores (grocery) lists – one with complimentary items and the other with luxury items chargeable to guests add to the at-home feeling. The icing on the cake? 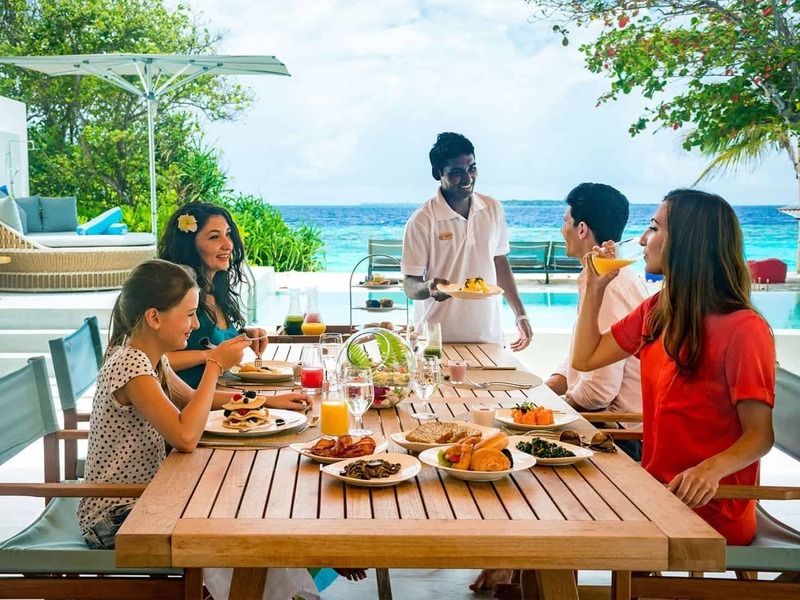 Residents enjoy access to Amilla’s astonishing facilities: world-class restaurants; myriad diving, water and land-based activities; kids-&-teens club; and a world-class spa, gym and wellbeing centre. 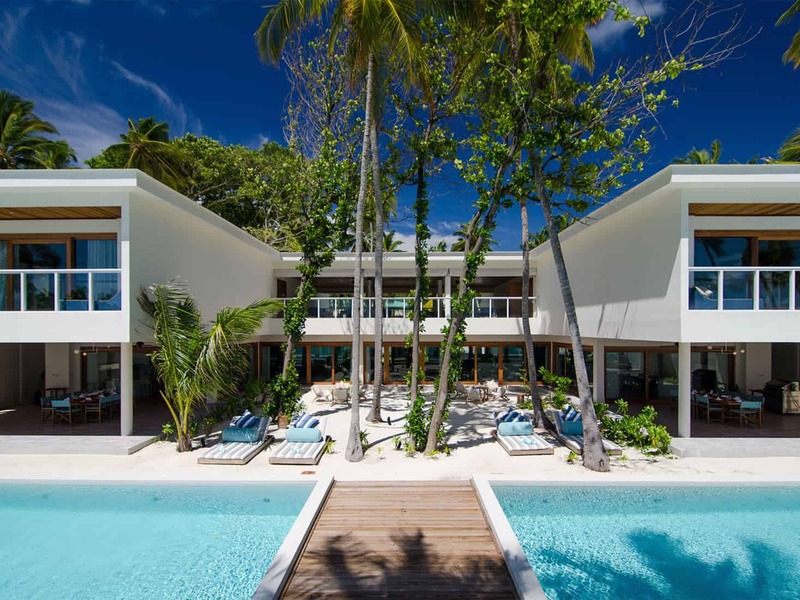 Kate Moss named this estate “the most idyllic and relaxing place on earth”, reached by seaplane or a short domestic flight from Male International Airport (and ten-minute speedboat ride). Alternatively private yachts are welcome at the resort’s marina. 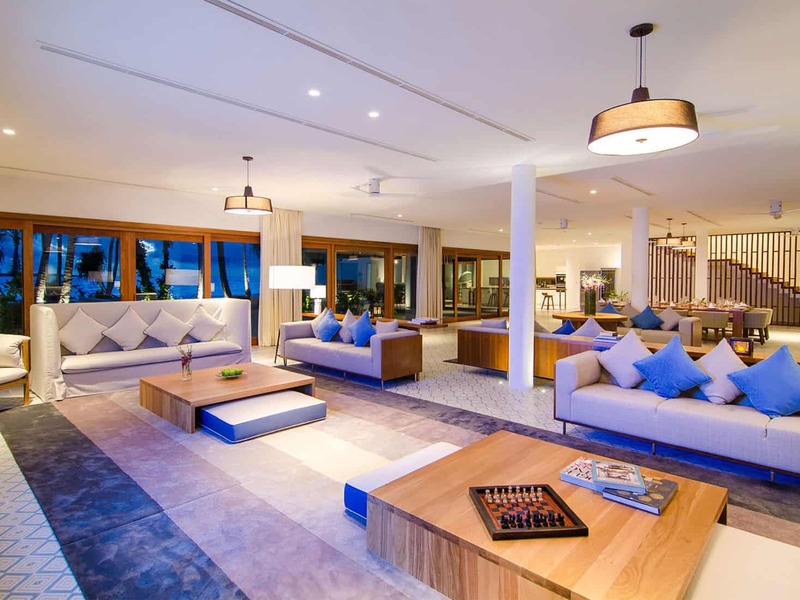 The 8 Bedroom Great Beach Villa Residence is the largest of eight luxurious rental properties at Amilla; smaller groups can opt for the 6 Bedroom Amilla Villa Estate or one of the six 4 Bedroom Villa Residences. 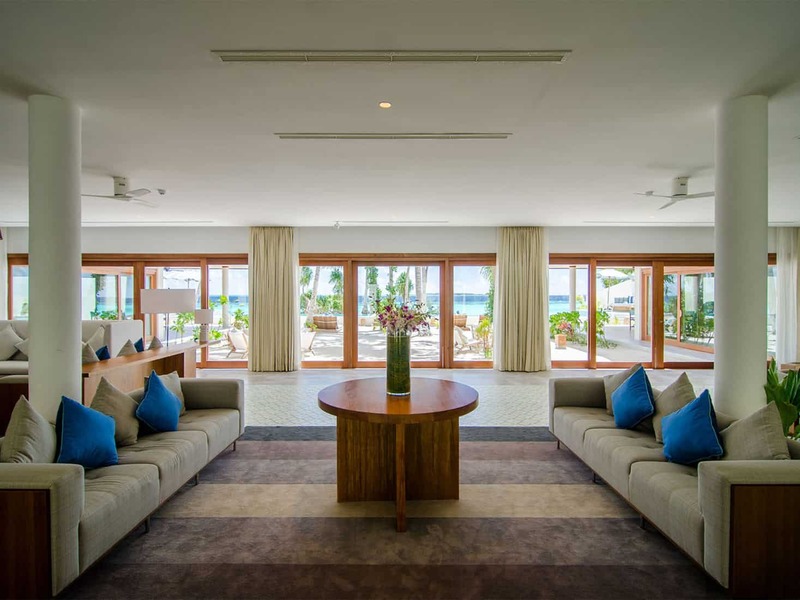 Bedrooms/Baths Description: Two enormous master bedroom suites – each with study area, dressing area, double basins, huge walk-in rain shower, alfresco shower courtyard, sea-view bathtub alcove, and bedroom with super-sized bed facing the ocean beyond the glass-fronted balcony. Four upstairs guest bedroom suites – two with king beds, two with twins. 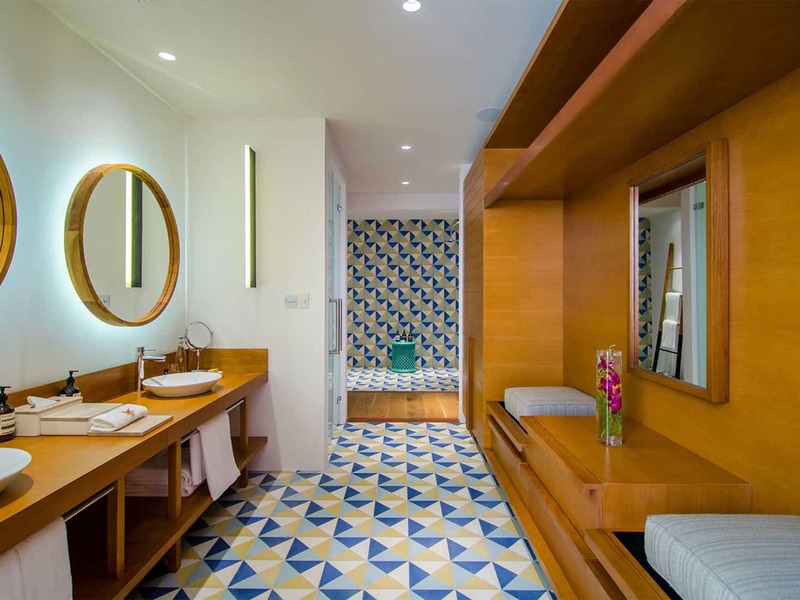 All have tree-top balconies with statement bathtubs, bathrooms with twin basins and separate shower enclosure (the king bedrooms also have an alfresco shower), and a walk-in wardrobe. The two guest bedrooms on the garden level each have 2 single beds and ensuite shower room. Pillow menu, Bose sound systems, TVs with satellite channels, and safes large enough for a laptop in all bedrooms. iPads in both master bedrooms. Services Included: Residence manager overseeing all residences; house master (katheeb) and assistant house master, who can prepare snacks and light meals; housekeeping; maintenance; security. Chef is on call for special dining requests. Providore: an extensive grocery list from which guests pre-select complimentary food items which are stocked at the villa to cater for guest breakfasts and light lunches. A second (chargeable) Providore list of premium meats, cheeses, fruits and other luxury items is also available. Complimentary daily afternoon tea pastries and pre-dinner cocktail snacks.Gourmet dining: (complimentary for low, shoulder and peak season bookings) offering Japanese, Mexican, Asian menus, plus seafood barbecues and grills or choose to dine complimentary at the resort restaurants: Baazaar (WOK, Barolo, Fish & Chip, Joe's Pizza, Fresh and Bar); Feeling Koi (fine Japanese/Mexican fusion dining), Emperor Beach Club (gourmet café and deli). Home delivery available.Wine Shop & Cellar Door: extensive wine list charcuterie and cheese. COMMUNICATION Mobile phone, in-room phones; WiFi; computer and printer. ENTERTAINMENT iPods (living room and master bedrooms); TVs and DVD players (living room and all bedrooms); selection of books and DVDs; Table tennis table; pool table; PlayStation 4 (plus games); board games. ISLAND TRANSPORT A personalised ‘Rolls’ beach buggy and a fleet of bicycles are provided at every villa, but if a gentle, sand-between-the-toes, walk is your preferred mode of transport, most island amenities are just a short stroll away. 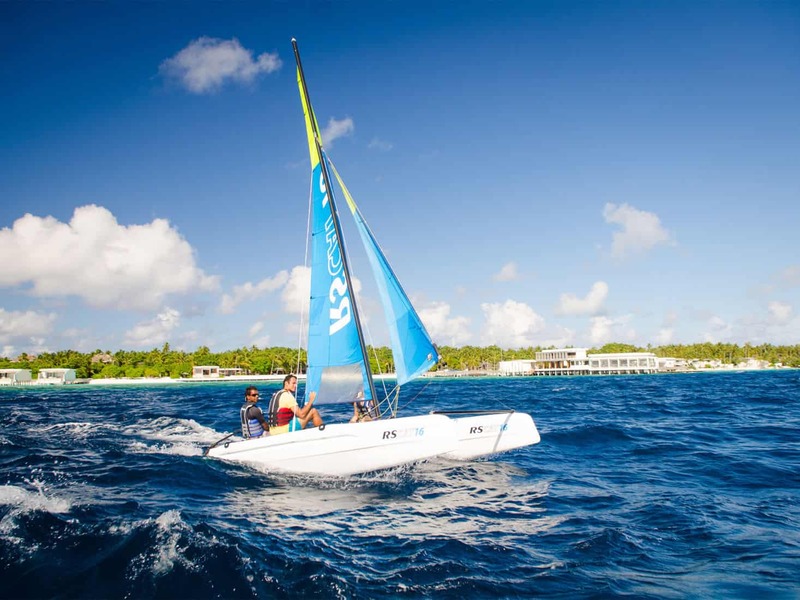 MARINE ACTIVITIES Scuba diving; PADI dive training; dolphin-watching; snorkelling with mantas; turtle safari; big game fishing; jet skiing; water skiing; wakeboarding; parasailing; catamaran sailing; windsurfing; skibob wave-runner; speedboat and dhoni hire (all on guest account). LAND ACTIVITIES Football; badminton; volleyball; table tennis; Frisbee; Pétanque; giant chess; arcade games; book library; board games; artist studio (classes on guest account) and use of 2 tennis courts. 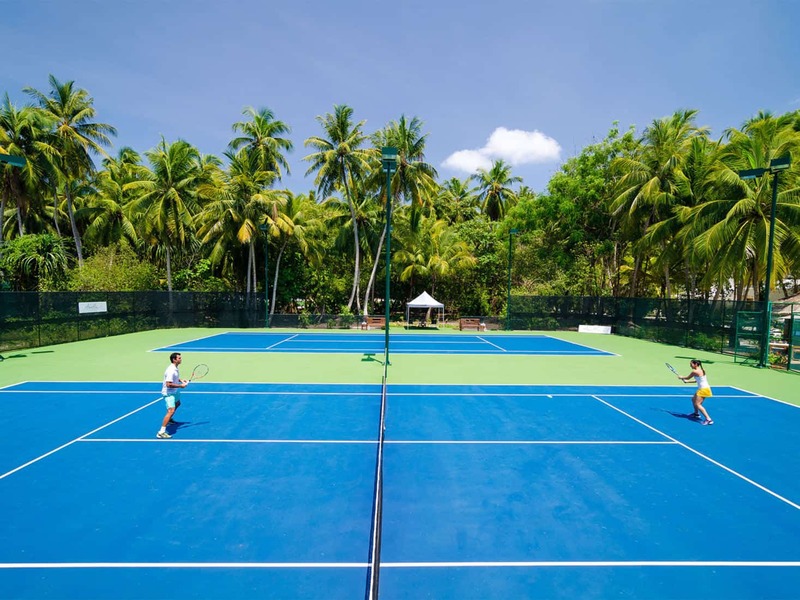 Guests may book a session with a Tennis Pro managed by Jim Courier Tennis for an extra charge. 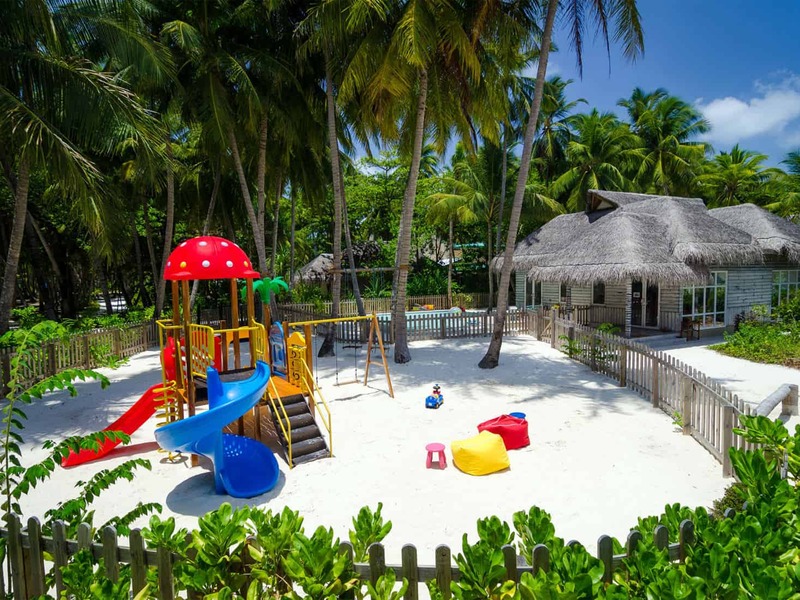 FAMILIES Sultan’s Village Kids Club with day-long activities, an air-conditioned supervised clubhouse full of toys and games, fenced garden with paddling pool and playground; complimentary babysitting. Outdoor Facilities: Two dining terraces, each with table for 10 and barbecue area. 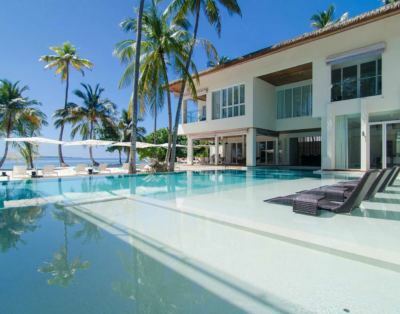 Two 11 x 5-metre infinity swimming pools right on the beach edge. Raised sun decks with circular loveseats and large sunshades. 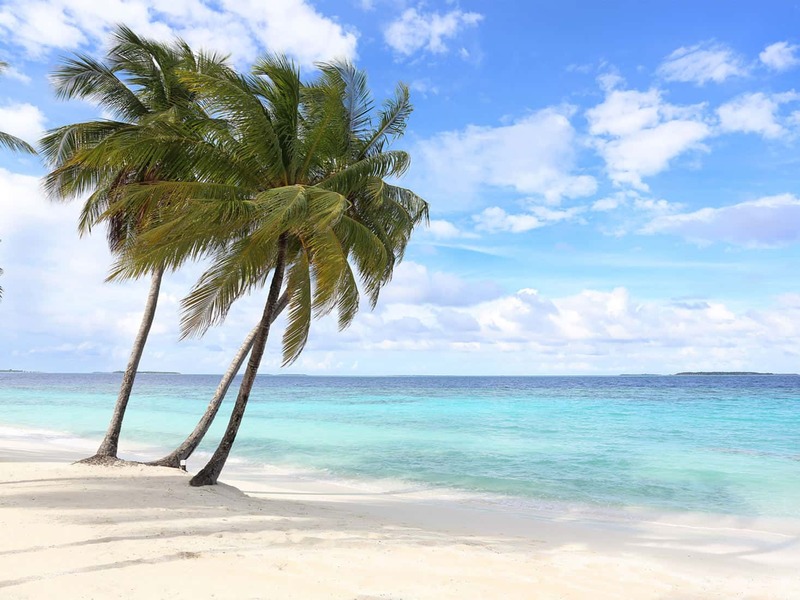 Four double sunbeds set on the sand. Casual seating areas in the beach courtyard.